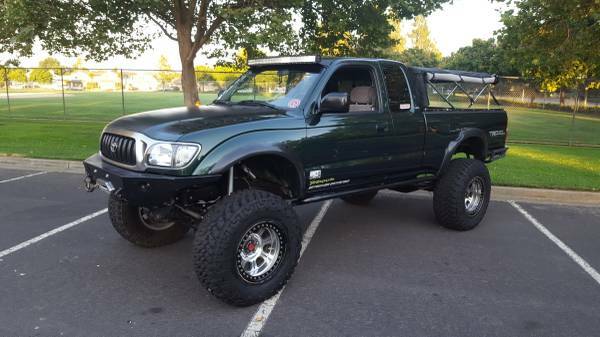 This 2001 Toyota Tacoma SR5 is located in Vacaville, CA. It is a 4WD model with solid front axle swap. A set of 17" Raceline beadlock wheels with 35" Nitto mud terrains are suspended by 12" Fox remote reservoir shock absorbers. The bed is covered by a Snugtop soft camper shell with custom LED lights, and has a large custom center drawer. The transfer case is an Inchworm dual setup with Marlin 4.7 gears and upgraded sealed shifter base. It contains dual row bearings for durability. The final drive consists of 8" Nitro 29 spline gears with a 4.88 gearing f/r. The front axle is equipped with a Lockright Locker and the rear contains a Toyota E-locker. Overall, this rig appears to be very well setup for virtually any off road situation. The wheels and tires have less than 500 miles on them and the chassis has 178,000, as indicated by the odometer. More photos and link to the Craigslist ad are located below. The original ad can be found here.